Jen Macbeth hates what happens every summer, and it has nothing to do with heat and thunderstorms. As co-founder of the Southwest Florida House Rabbit Rescue, the instructor in Florida Gulf Coast University’s Department of Marine and Ecological Sciences and her bunny-loving brigade have to clean up the mess – figuratively and, in many cases, literally – left by irresponsible adults who use rabbits as impulse-buy Easter gifts that become yesterday’s novelty in a few weeks. According to the rescue, eight out of 10 rabbits bought for Easter are looking for new homes by midsummer. In a best-case scenario for the unwanted pets, either the owner or advocates such as Macbeth’s rescue group find Thumper loving foster care. Worst case, Bugs is sent free along the bunny trail, doomed to live in fear before he’s eventually killed and eaten by a predator. Or perhaps Peter ends up in the belly of a big snake after the reptile’s owner responds to a free-rabbit-to-good-home Craigslist ad. Unless you are willing to take care of a high-maintenance pet that can live 10 years; never stops chewing because its teeth never stop growing; can get aggressive without specialized spaying or neutering that costs about $300; should be socialized and live indoors in cages that can cost up to $100; are willing to provide rabbit diet, hay, fresh veggies and fruits, toys and other supplies that add up to even greater expense – and, of course, embrace cleaning dirty cages and a seemingly endless stream of tiny, round poop pellets – well … you better just keep walking past that pet-shop display with the huggable litter of cute baby bunnies, and don’t look back. 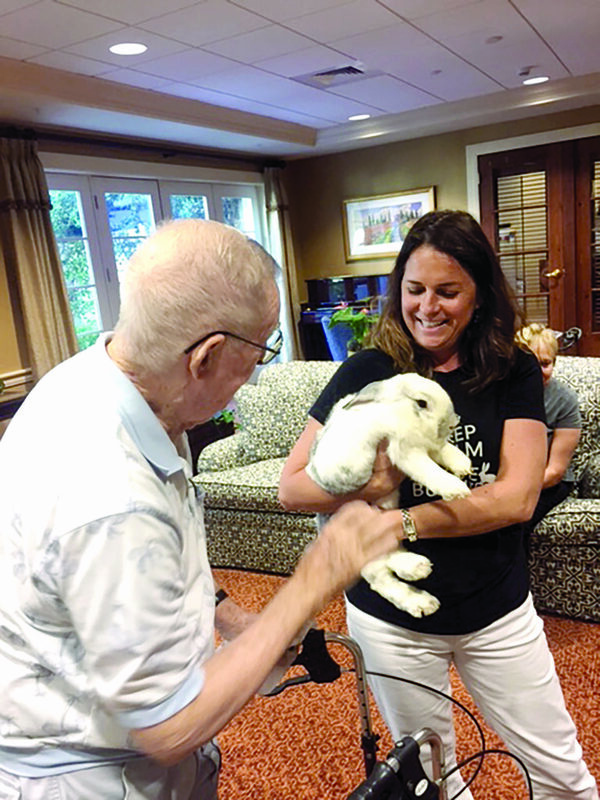 Florida Gulf Coast University Instructor Jen Macbeth greets a resident of The Terraces at Bonita Springs with a foster rabbit during a pet-therapy visit. Growing up on a farm in Hamburg, Pa., surrounded by animals, Macbeth used to think rabbits were simply livestock that belonged in outdoor hutches. It was only after she took in a wayward rabbit running loose on the campus of Loyola University during her own schooling that she realized bunnies are actually highly social animals that, when domesticated, need to live indoors, preferably with a bonded mate. Macbeth co-founded the rescue in 2015 with Naples resident Lisa Walkup, a recruiter for Physicians Regional Healthcare System, after the two met by circumstance in the waiting room of a Fort Myers veterinary office as they sought treatment for their respective pet rabbits: Macbeth’s beloved Basil and Walkup’s Bumble Bee. 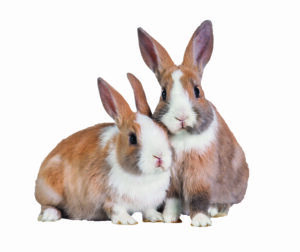 They went their separate ways that day, but after a Naples woman took in two wayward bunnies roaming her neighborhood that quickly turned into a pack of six – “Rabbits can reproduce every 31 days,” Macbeth said – the Good Samaritan desperately contacted the Fort Myers vet for help. The vet referred her to Macbeth and Walkup, and Southwest Florida House Rabbit Rescue was born. The rescue’s reputation and popularity really took off about a year ago when Macbeth and Walkup drove all the way to Jacksonville to save Fuzzy Pants, a young rabbit that had been seized from three teenage girls who posted a video of themselves on Snapchat throwing the bunny against a wall and kicking the frightened animal. The girls were arrested and charged with felony animal cruelty after some parents saw the video and alerted law enforcement. Fuzzy Pants ended up in a loving foster home cuddling with a new bonded mate after the story got national attention and a gofundme.com page Macbeth set up raised almost $8,000 for the rabbit’s medical treatment and care. “Rabbits are the third-largest pet population in the United States, so there’s a big need for rescues,” said Macbeth, who “tries to keep my limit at 10 bunnies” in her own foster home, which she and the rabbits share with her husband, their 2-year-old child and a turtle. SWFL House Rabbit Rescue is now working with six local foster homes, where the long-eared clients get socialized, litter-box trained, spayed or neutered, bonded with other rabbits and, hopefully, adopted out with a take-home bundle of rabbit-care education. As part of its outreach, the rescue even sends pet-therapy bunnies to cheer elderly residents of The Terraces at Bonita Springs. That kind of education – whether it be furthering social awareness and responsibility of students such as Raponi, or that of previously unsuccessful or potential future rabbit owners – is what Macbeth and the rescue are all about. Just something to consider when shopping for Easter gifts next spring, before you make Jen Macbeth’s summer of 2018 miserable.